The necessity of avoiding the residential school is conveyed in the horrifying opening sequence of Rhymes for Young Ghouls. Alia, just a young girl at the time, plays with her brother, as her mother, father, and uncle get smashed at the kitchen table. The rowdy evening is punctuated by the pain and violence that the residential schools have spilled from one generation to another. A horrible accident leaves Alia alone and her father in prison. Alia is thus a member of a lost generation, growing up without parents and having only the folklore, language and myths of her clan that have survived. She’s a child among zombies and, as her elders say, rez zombies are the worst. Rhymes for Young Ghouls doesn’t shy away from showing the violence and suffering that has been the legacy of the residential schools. Life on Red Crow is tough for Alia as it’s a daily struggle of working to evade admission in the schools while growing up in a home that affords little care and stability. The people in Alia’s community, survivors of the schools, spend the nights getting fucked up on cheap booze and drugs to numb the lingering pain. The spirit of a strong people remains in Alia, who braves Popper, gets even with the rez, and releases the ghosts of the past so that the healing may begin. Barnaby and Jacobs create a powerful and compelling lead in Alia. Reminiscent of a stoic young a heroine of an Eden Robinson tale, Alia is wise beyond her years thanks the fire of her people that she carries within her. She is a strong female warrior, a mother for the next generation who has the resilience to express her anger as she refuses to remain a victim. Barnaby invests the film with folklore to fuel Alia’s quest, most notably an effective fable told to Alia by an elder that tells of a beast that consumes itself for pure self-pleasure. The fable, rendered in stunning and haunting animation, offers an accessible parable about the greater implications of surviving a cultural genocide that underlies Alia’s quest. Rhymes for Young Ghouls feels like a landmark Canadian film as Alia chooses between running and fighting back. Gritty and proudly badass, Rhymes for Young Ghouls has an air of supernatural realism as Barnaby creates a setting that feels almost like a horror tale as the people of Red Crow live the ghosts of the residential school. Production efforts are top notch, most notably the cinematography by Michel St. Martin, the editing by Barnaby himself and the film’s heart-pumping soundtrack, as Rhymes for Young Ghouls forges a voice of its own. Rhymes has echoes of Trainspotting and overtones of Rebelle as Alia witnesses the substance abuse and violence that go hand in hand, but remains a strong perseverant young warrior to begin the healing. The film almost defies classification with the tone, energy, and atmosphere the team creates. It’s brutal and frank, but also darkly funny and wickedly entertaining. It’s about time a film took such a tone to bring the story of the lateral violence of the residential schools to the screen. The film honours the First Nations people that have been victims of the schools by offering some troubling flashbacks that reveal the days in which Alia’s father, Joseph, withstood gratuitous abuse and violence. The elder Joseph is portrayed by Glen Gould, whose performance is as powerful as Jacobs’ is. (The cast is quite strong overall.) Most powerful in Rhymes for Young Ghouls, however, are the images of the ghosts that walk the halls of the school and the forest that surrounds it. When Barnaby finally takes the audience inside the school, Rhymes for Young Ghouls allows the audience to feel an utterly dehumanizing experience that needs few words to convey. The finale is uplifting, though, and a sign of hope to come as the nightmare finally comes to an end. 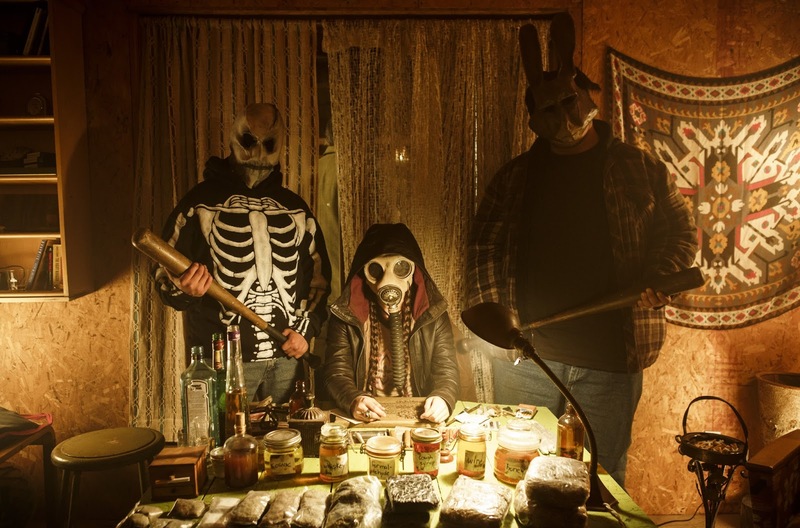 Update: Rhymes for Young Ghouls screens in Ottawa at The Mayfair beginning April 18.